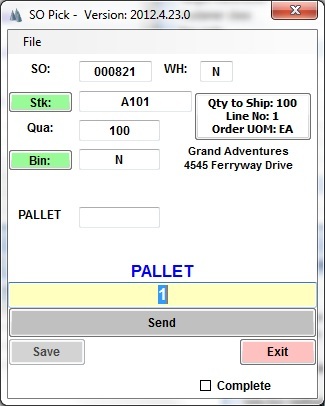 The ABC Barcoding Sales Order Module allows you to process Sales Orders from a wireless scanner. Enter a valid Sales Order. The ABC Barcode Monitor will check Syspro data to make sure the Order exists and is in a valid status. 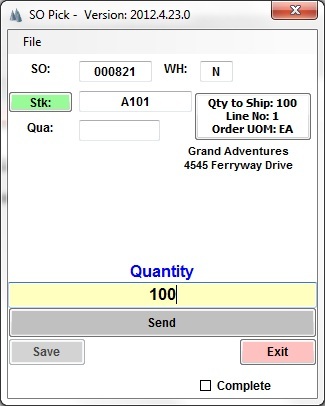 Valid Sales Order Status can be configured. Scan or enter stockcode on the sales order. Then enter quantity. If you select the green button called Stk: you will see all lines on the sales order as shown below. You can enter pallet number. This is an optional question that can be turned off if necessary. When you have picked all lines, the click on the Complete check box. This will then move your scans into Syspro.